Here's the scenario: you have the opportunity to purchase a mare carrying a foal that is guaranteed to be a winner. In fact, the foal is even guaranteed to earn more than its training, feed, and veterinary costs. Profit! Here's the catch: the foal's dam shouldn't be bred again and will need to be retired. You've just purchased a winning racehorse-to-be, but you got a package deal that includes a pasture ornament that might live another 10 years -- with all the attendant bills for board, feed, and veterinary services. The foal will show a profit relative to its own costs -- but it's up in the air whether it will earn enough to cover its dam's retirement. Is this a risk worth taking? Race record: 2 wins, 2 places, 1 show from 10 starts for earnings of $31,830. Sale history: $250,000 Keeneland July yearling (1988); $18,000 Keeneland January broodmare (1992). Covering sire: Slew City Slew (SRO). Entered stud 1990. 2008 stud fee: $6,000. Can't say enough about Thoroughbred family 4-m (I've commented before on this family), and here we have a fairly successful branch through the fine broodmare Alanesian, third dam of Marie's Pride. In fact, the carried foal will have a 5 x 4 Rasmussen Factor cross to Alanesian, because Slew City Slew's great-grandsire is the mare's most famous offspring, the Bold Ruler stallion Boldnesian. Five of nine foals of racing age earned six figures on the track -- a phenomenal record. Seven winners from eight runners is quite good. 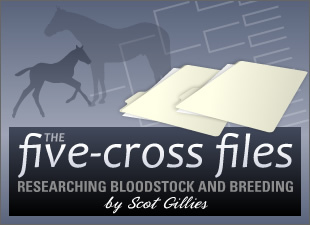 Three black type offspring beats the odds for any broodmare. In short, foals out of Marie's Pride are regularly above average. And Slew City Slew as a covering sire is almost a sure thing. (In fact, he was #1 on my list of breed-to-race sires for 2008.) Over 88% of his foals aged 3 and up have raced -- and 77% of those runners have won. Nearly 16% of these foals are black type horses, with lifetime earnings of $39 million from 670 offspring. If you're looking at a mare carrying a Slew City Slew foal, though, you'd better plan to raise and race the foal yourself. For whatever reason, "Slew" has not excited bidders at the Thoroughbred sales, and he is unlikely to net you a huge profit at the auction.